http://edition.cnn.com/CNN/Programs/showbiz.tonight/ The shows are based on a Alex Jones radio interview with Charlie Sheen and imply that the US government is lying and was most likely behind the attacks of 9/11. 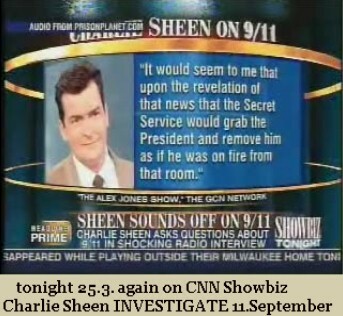 First CNN Showbiz Show on March 22 Statements of actor Charlie Sheen that there is more behind the official 911 story is discussed. In the first half the statements from Sheen are played, in the second half there is the discussion with the leader of 911truth.org and the producer of "Inside 9/11" of the 'National Geographic Channel'. CHARLIE Sheen has joined the 9/11 gone-bonkers brigade - The "Two and a Half Men" star gave a bizarre interview on GGN Radio Network's conspiracy-minded "The Alex Jones Show," in which he suggested that the federal government was covering up what "really" happened. "It seems to me like 19 amateurs with boxcutters taking over four commercial airliners and hitting 75 percent of their targets, that feels like a conspiracy theory. It raises a lot of questions," Sheen said. "A couple of years ago, it was severely unpopular to talk about any of this. It feels like from the people I talk to, and the research I've done and around my circles, it feels like the worm is turning." Sheen said the collapse of the Twin Towers looked like a "controlled demolition." The out-there actor also expressed his disbelief over how one of the planes hit the Pentagon. "Just show us how this particular plane pulled off these maneuvers . . . It is up to us to reveal the truth. It is up to us because we owe it to the families, we owe it to the victims, we owe it to everyone's life who was drastically altered, horrifically, that day and forever. We owe it to them to uncover what happened." VIDEO: Hannity & Colmes Piece on Sheen 9/11 Comments - The CNN poll showing 82% support for Charlie Sheen directly contradicts a line of attack used in this Hannity and Colmes piece Thursday night which claimed that Sheen's views didn't reflect the mainstream of America. If we are to treat an 82% majority as the mainstream then that accusation is completely fraudulent. Charlie's conspiracy angels - Actor Charlie Sheen, speaking to a radio station last week, called for more investigation into 9-11 because the World Trade Center buildings look like they "came down in a controlled demolition." He finds it unlikely that 19 amateurs with box cutters took over four commercial airliners and hit 75 percent of their targets, and questioned whether it was a plane that hit the Pentagon. OK, Chuck. Fair enough. Bring on another investigation, and another, and another  and keep doing it until it turns out the way you want it to. Then you can go back to your "Two and a Half Men," I'll go back to my two sons and a daughter, and we can move on. Deal? VIDEO: CNN Produces Balanced Piece On Sheen 9/11 Comments - Tonight marks the first instance where those that question 9/11 were given a fair shake at voicing their opinions. While little can be said in just 10 minutes of coverage, it was at the very least a reasonable discussion and an important milestone for the 9/11 truth community. 911truth.org's media coordinator Mike Berger did a great job with the short time he was allotted while the host A.J. Hammer allowed for a good live discussion and avoided the all-to-familiar Bill O'Reilly style of 'news'. THE TALK SHOW HOST WHO INTERVIEWED CHARLIE SHEEN APPEARS ON CNN: Video: Alex Jones On CNN Showbiz Tonight - Watch Alex's appearance on CNN's Showbiz Tonight in which he not only successfully defends Charlie Sheen but also batters the Globalists with a raft of facts on the 9/11 inside job. THE TALK SHOW HOST WHO INTERVIEWED CHARLIE SHEEN APPEARS ON CNN AGAIN: VIDEO: Alex Jones' Second Appearance On Showbiz Tonight - "And the new world order better stop carrying out terror attacks. We`ve caught them over 200 times in the last 100 years, western governments doing this. Hitler does it; the British do it; the Russians did it. Governments do this." Alex continues his rampaging defense of Charlie Sheen and encourages Americans not to just believe us but check out the facts for themselves. Actor Charlie Sheen Questions Official 9/11 Story: Calls for truly independent investigation, joins growing ranks of prominent credible whistleblowers - Actor Charlie Sheen has joined a growing army of other highly credible public figures in questioning the official story of 9/11 and calling for a new independent investigation of the attack and the circumstances surrounding it. MSM Attacks Charlie Sheen Over 9/11 Comments: Finally covers story, Neo-Cons start frothing at the mouth - The mainstream media has finally seen fit to cover Charlie Sheen's comments on 9/11with both the New York Post and the Boston Herald penning hit pieces that seek to smear Sheen as an unstable crackpot. Several smaller Neo-Con websites are also frothing at the mouth at the latest example of what they see as a Hollywood led 'vast left-wing conspiracy'. Huge Reaction To Sheen 9/11 Story: Linked on Drudge, later removed - Yesterday's Charlie Sheen story, in which the actor went public with his grave suspicions about the official story of 9/11, received widespread interest across the Internet and was even linked on the Drudge Report for a time, a news website that gets more traffic than the New York Times. No Longer The Minority: 82% Plus Support Charlie Sheen: Over four-fifths back his public stance on 9/11 - Despite the best efforts of the now whimpering attack poodles of the mainstream media, an online CNN poll shows that over four-fifths, or 82 per cent, agree with actor Charlie Sheen that the U.S. government covered up the real events of the 9/11 attacks. Every establishment media mouthpiece aside from CNN tried to hang Sheen on his own words but it simply didn't work because those same questions are firing the synapses in the heads of millions upon millions of other taxpaying American citizens. Charlie Sheen: A True American Patriot - If there was ever any doubt as to what it is that really made America the greatest nation on Earth that ever existed, let all that uncertainty be dispelled by the actions of Hollywood actor and Television star, Charlie Sheen. Indeed, what a guy! Our nation's greatness is founded upon the legal pedestal we continually attempt to sustain that puts the individual and his or her freedom above all else in this land, the very freedom now being savagely assaulted by the Bush regime and America's traitors in Congress. Reporter Jon Rappoport Confirms Google Censorship Of Sheen Story - Well, the Alex Jones-Charlie Sheen story has started going mainstream. CNN did a short piece on it---on TV. The story still has not made it as a specific investigative news piece in the mainstream. That is to say, no one in the mainstream press has actually dug into the facts Sheen and Jones presented in order to draw intelligent conclusions. Of course, how many news stories actually draw intelligent conclusions? Charlie Sheen 9/11 Story Goes Viral: Alex Jones appears on CNN, poll says three-quarters plus support Sheen - The Charlie Sheen 9/11 story is set to roll into Friday still at the height of its controversy now being the discussion of thousands of forums and blogs, more mainstream coverage and Thursday night's appearance of Alex Jones on CNN's Showbiz Tonight. Meanwhile, a CNN poll shows that three-quarters of Americans support Sheen's stance. story of 9/11 & Kean Commission a fraud. 8th Ave. betw. 58th & 60th St.
Last week the "Showbiz Tonight" program on CNN Headline News aired three programs we believe deserve commendation. We, of the 9/11 truth and justice movement in New York City are heartened that the network saw fit to air extensive segments giving fair coverage to Charlie Sheen's comments about September 11th - as well as a platform for 911Truth.org spokesperson Mike Berger, uncompromising radio host Alex Jones, and Webster Tarpley, author of 911 Synthetic Terror: Made in USA. For the first time since the fateful day in September of 2001, mass-audience television broadcast alternative perspectives on what really happened. Now is time for all media to show some backbone and actually explore all the reasons why millions and millions of people no longer believe the Official Story of September 11th, 2001. Now is the time for those millions of people who do not believe the official story - a majority of this City's residents, according to a 2004 Zogby poll - to realize that it's safe for them to speak openly about their suspicions with friends, family and neighbors, to recommend books like Crossing the Rubicon and The New Pearl Harbor, or videos like The Great Conspiracy. This should finally open the network's eyes, and the eyes of its viewers, to the need for the airing of much more such information, information which is available. We urge CNN editors to review the "Top 40 Reasons to Doubt the Official Story of 9/11," on the reverse, and pursue the stories that the mass-audience media have so far failed to cover. (Watch for the publication of the list with full explanations next week at 911Truth.org.) The public has a right to know what lays hidden beneath the facade of the official story on 9/11. Thank you CNN for taking a step in the right direction! Let's see more 9/11 Truth! "Do you agree that the U.S. government covered up the real events of the 9/11 attacks?" (1) Send a message to CNN thanking them for their fair coverage of 9/11 on Showbiz Tonight. (2) Let them know that they can count on your continued viewership - as long they continue to cover the question of whether 9/11 was an inside job fairly and openly, on CNN's news programs as well as entertainment programs. (3) Go to 911Truth.org and other 9/11 truth sites, inform yourself about the great deception that has been perpetrated on us, and get involved with putting an end to it! March 22-24, Progressive Press Press Release Dam Breaking for 9/11 Truth - Alex Jones, Webster Tarpley, Charlie Sheen hit the Mainstream. Hottest item of the month on the popular free press release site http://www.free-press-release.com/news/200603/1143065487.html.